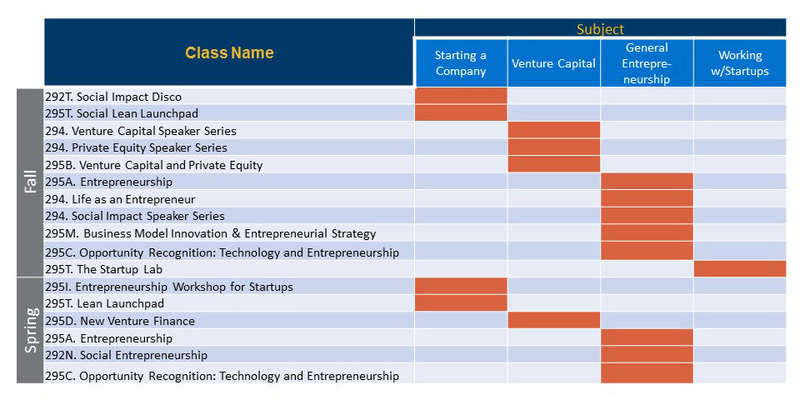 Berkeley-Haas faculty offer a wide range of entrepreneurship courses with an emphasis on Lean Launch methods and extending to specialized social impact and technical areas. Courses are geared both to students interested in an introduction to entrepreneurship and those who want in-depth immersion in the three phases of the entrepreneurial journey: ideation and team formation, customer discovery and validation, and startup acceleration. Whether you are interested in an introduction to entrepreneurship, want to learn more about venture capital and financing, or launch your own company, we have a wide range of offerings. Berkeley-Haas faculty collaborate with faculty across campus to offer entrepreneurship courses with a social and technical focus as well. While virtually all enterprises, commercial and social, generate social value, fundamental to this definition is that the primary focus of social entrepreneurship is to achieve social impact above all else. How can organizations achieve greater social impact through social entrepreneurship? Oftentimes growth seems to be the answer. Without a doubt, many social enterprises (SEs) have achieved significant impact by scaling. Yet, the process of organizational growth also poses tremendous challenges. Even when organizations manage to overcome the many obstacles to growth, and achieve appreciable scale, this approach is seldom sufficient to achieve significant social impact on its own. This course explores how to utilize social entrepreneurship to generate social impact as efficiently, effectively, and sustainably as possible through two primary means: 1) through organizational level growth and innovation and 2) through network approaches which require the mobilization of a vast array of actors and resources beyond organizational boundaries, but have the potential to generate rapid and sustained social impact. This course is offered by the Center for Nonprofit and Public Leadership. The Impact Disco course is a high-octane, fun, single weekend course for students who are interested in meeting other social change makers and getting hands-on experience with implementing a social venture design methodology to develop a new social start-up concept. The course pedagogy uses a combination of “Purpose-centered Design” and the Lean Start-up Methodology. Additionally, this unique course incorporates aspects of hackathons and start-up weekend formats to systematically guide students through a sprint formation and ideation process. Impact Disco uses case method, guest speakers, lectures, readings and flipped classroom content to deliver instruction. Students will begin the course by developing, advocating for and then prioritizing a long list of ideas, which then students will choose in order to form teams. At the end of the course, each team will present their validated concepts and their next steps plan to a panel of experts. Life as an Entrepreneur is a speaker series for first year, first semester MBAs and other students who are aspiring entrepreneurs or simply wish to know more about the entrepreneurial world. Speakers come from a wide variety of companies and stages of growth and include experienced successful entrepreneurs as well as Venture Capitalists and Angel investors. Students hear from inventors, scientists, engineers, lawyers and venture capitalists; gain inspiration from recent graduates and their companies; and receive real market data that help them pursue their entrepreneurial ideas. Recent speakers included Katrina Lake, Founder & CEO of StitchFix, Bambi Francisco, Founder and CEO of vator.tv., and Marissa Mayer, CEO of Yahoo. This course will cover various aspects of the venture capital industry from the perspectives of venture capitalists and entrepreneurs. Guests will be invited to introduce their venture capital firms and share insights from their experiences in the industry. Topics will include the investment process, seed to late stage investment, industry trends, fundraising as an entrepreneur and sector specific discussions (i.e. IT, consumer, web, biotech, etc.). The objective of the course is to provide those interested in venture capital or seeking venture capital funding the opportunity to learn from and engage with prominent figures in the industry. The objective of the Private Equity Speaker Series, a one-unit seminar class, is to provide students with an overview of private equity investing through weekly interactions with a diverse group of accomplished industry professionals from institutions such as buyout funds, mezzanine capital funds, equity fund limited partners, and third-party service providers. In addition to reviewing the roles of each party involved, the course will also focus on various steps in the deal process, demonstrate the varying investment strategies of select industry players, highlight current market trends, and provide both financial and strategic insight into this dynamic asset class. The course aims to provide an introduction to multiple facets of a private equity investing for all students, ranging from those preparing for a career in private equity to those simply interested in learning about the industry. The Social Impact Speaker Series will introduce students to a number of leaders within the social impact space. Speakers will hail from the public, private, philanthropic and nonprofit sectors across domestic, international and global organizations and will include some of the most forward-thinking leaders in the sector, including guest lecturers from Ashoka, Education Pioneers, FSG Social Impact Advisors, Kickstart, REDF, and SV2. The class will consist of twelve two-hour meetings covering three main sections: Business Models, Industries and Future Trends. Each class will have two to three guest lecturers and will be conducted in a panel style where faculty and/or 2nd year MBA students will lead the conversation on each specific topic. This course focuses on how to identify attractive opportunities and to design and build new ventures. The pedagogy in the course includes case studies, vigorous classroom debate, video, and in-class visits from case protagonists. In addition to conveying frameworks for opportunity identification, business model development, raising financing, building founding teams, and growing nascent ventures, one of the major objectives of this course is to model the work life of a variety of entrepreneurs so that you will have the chance to personally reflect on your desire to pursue this type of career. Throughout the course, the cases and our discussions will have as their focal point the entrepreneur who, in the face of great uncertainty, must make decisions and take action. Venture capital is core to our Silicon Valley high-tech economy and our country’s strong growth over the past two decades. UC Berkeley is located in the “mother lode” of this very special and unique investment category. This course provides an advanced offering for those who intend to seek, or manage, venture capital funding. It is appropriate for students who aspire to become CEOs of entrepreneurial ventures or general partners of venture capital firms. This course is intended to provide the core skills needed for identifying opportunities that can lead to successful, entrepreneurial high technology ventures, regardless of the individual’s “home” skill set, whether technical or managerial. It takes an in-depth look at the approaches most likely to succeed for entrepreneurial companies as a function of markets and technologies. Emphasis is placed on the special requirements for creating and executing strategy in a setting of rapid technological change and limited resources. This course is particularly suited for those who anticipate founding or operating technology companies. This is a course for current/future entrepreneurs on how to finance and fund a startup or high-growth business. The course centers on a model that includes strategic planning, financial analysis, business model creation, cash management, funding alternatives, investor pitching, alternative financing, and exit strategies. We examine the various options that a company has for financing at all stages of its life-cycle – from seed stage to later stage – using a blend of lectures, cases, readings and speakers (venture capitalists, CEO/founders, industry experts and service providers) to address the full range of financing options including angel, venture capital, debt financing, corporate/strategic investment and public markets. A unique feature of the EWMBA version of this class is the “real-time” company – throughout the course, a CEO from a company that is currently grappling with the new venture finance process will join us for class. Members of the class will have the opportunity to apply what they learn to this company throughout the semester, including assisting the company in setting its internal financial plan, external fundraising process and culminating with a live pitch to investors. Students actively developing a business plan take this course to understand how new businesses form and gain focus on their opportunities. This class typically follows the main Entrepreneurship class and allows dedicated teams to pursue their goals. Structured as a clinic, the course typically has up to 15 ventures under development. Students have the opportunity to consult to other venture teams and receive advice from other members of the class. Over the years, up to half of the ventures developed in this class have launched. The course examines innovation in business models as a critical aspect of successfully starting new enterprises. It reviews the business models of over 50 companies, new entrants and incumbents, and explores the successful strategies of entrant firms and the reactions of incumbents. Students learn how new enterprises use innovative business models to obtain success and avoid the challenges put forth by incumbents. The class uses case studies, short lectures, discussions and guest speakers to reinforce frameworks and showcase actual business examples. Students apply the models developed by the course to their own ventures and fields of interest. This course is not about how to write a business plan but provides hands-on learning on what it’s like to start a high-tech company. The goal is to create an entrepreneurial experience with all of the pressures and demands in an actual early-stage startup. You will work in teams to talk to customers, partners, competitors, as you encounter the chaos and uncertainty of how a startup works, and learn how to turn a great idea into a great company. You will use a business model to brainstorm each part of a company and customer development to get out of the classroom to see whether anyone would want/use your product. Finally, based on the customer and market feedback gathered, you will use agile development to rapidly iterate your product to build something customers would want to use or buy. The Startup Lab is a project-based experiential learning course that teams UC Berkeley students with local venture-backed startups in an effort to identify, frame and address strategic business challenges. Throughout the course, students will gain experience working within agile and dynamic startup environments while applying their academic knowledge in an entrepreneurial context. This unique class strives to create the conditions where students become social venture designers, founders, and leaders, and learn to create a business model that intentionally integrates financial objectives with measurable social and/or environmental outputs. Students will ideally work in interdisciplinary teams at an accelerated pace to practice the steps integral to starting a social venture. This course utilizes the Lean Launchpad and the Social Blueprint Business Design methodologies to frame the integral insights, strategies, and practices that distinguish social ventures, including: vision and values, innovative company legal structures, constitutional documents, stakeholder enrollment, business model design, and social impact assessment. As part of the course, each team is matched with accomplished practitioners who have graciously volunteered their time to serve as social venture mentor coaches, and personal and organizational leadership is emphasized through every stage of the process. The same startup idea can grow up to be many different companies. The route to taking a given idea to a sustainable and profitable company involves crafting a clear strategy — something you will learn in this class. In this class, we provides an integrated strategy framework for innovation-based entrepreneurs by (a) outlining four core strategic choices (customer, technology, identity and competition) that form the pillars of strategic decision-making and through (b) a framework that delivers four distinct strategic playbooks (IP, Disruption, Value Chain and platform) of how the core strategic choices are combined to form a successful strategy around a given entrepreneurial idea. The highlights of the course include case discussions based on custom, short and highly relevant cases from multiple industries (food, technology, fashion, healthcare etc) combined with short theoretical lectures and group exercises with clear, concise takeaways, an entrepreneurial strategy team consulting assignment with real startups and a final exam where you will solve a custom case and engage in a live debrief with the case protagonist. The course draws on rigorous research in entrepreneurial strategy that moves beyond the “one size fits all” approach to start-ups and instead focuses on the key choices that founders face as they start and scale their business. Click here for additional information. This course explores the idea and practice of social entrepreneurship, an emerging field where business models are increasingly being used to address important unmet social and environmental needs. The course exposes students to the growing breadth and depth of activity in the global social enterprise movement, where innovators are developing a new frontier of hybrid organizations that combine nonprofit motives and business methods. Course content examines the context and foundation for social entrepreneurship and explores the opportunity for social enterprise solutions in a number of areas, including healthcare, finance, education, technology, international development, and workforce development. Course design integrates instructor lecture, articles/cases/other reading materials, class discussion, guest speakers, and group projects where students develop a social enterprise business plan. Do you have an idea for a new business, but want to learn how to more fully develop this idea? Would you like to receive funding for your business idea, but lack a framework to ask for capital? This course takes students through the new venture process using a business plan as the main deliverable. A well-written business plan sets key milestones and indicates the resources needed to achieve them, in an increasingly complex business environment. Through the planning process that tightly links market and financial planning a business plan creates a set of standards to which investors and teammates can evaluate actual performance, laying the foundation for an “operating plan” once the business is launched. In this course, the goal is to have students identify their entrepreneurial interests through a combination of exploration, readings, and close interaction with successful entrepreneurs. Key projects include taking students through a systematic search to identify how their past achievements can best align with their career pursuits. Students will also take ownership of their entrepreneurial ideas through a trend analysis and elevator pitch. Students will receive coaching as they seek a summer internship or job. Whether students plan to join a startup upon graduation, or seek positions in more established firms, there is a role for entrepreneurship. This campus-wide undergraduate course, developed with The Blum Center for Developing Economies, offers students insights into whether and how entrepreneurial ventures can make a difference in tackling one of the world’s most urgent and daunting challenges: persistent and pervasive poverty. It integrates guest lectures by distinguished faculty in other departments with expertise in issues such as water, housing, transportation and energy with case studies and conversations with a variety of social entrepreneurs around the world. This course will introduce students to venture capital, private equity, and hedge fund industries. In the course, students will learn about venture capital, private equity, and hedge funds, and they types of investments they make and how they generate superior investment returns. The course will also address what professionals do in these firms, how they are organized, structured and managed, career paths available, and the risks and rewards these firms experience.